The housing of the EPH-52 Series has been designed with the driver and sound duct in a linear arrangement so that the sound from the driver is delivered directly to the eardrum. Materials with differing levels of hardness—ABS (acrylonitrile butadiene styrene) for the front section and polycarbonate ABS for the rear section—have been employed in order to reduce unwanted resonances, which cause muddiness. For precise audio reproduction, Yamaha equipped the series with high-grade earphones, finished the outside of the driver unit with a manganese alloy that ensures excellent damping performance, and designed the housing itself to control vibrations. Moreover, a sound-tuning pipe that controls unnecessary peaks in the high frequency register is built in to the unit. This keeps the bass sounding taut, which makes for a more pleasurable listening experience, and reproduces the high register with exceptional clarity so that all of nuances of the musical instruments can be heard clearly. The EPH-52 Series makes use of a special alloy primarily comprised of manganese. The alloy itself absorbs vibrations, and keeps the vibration absorption of a broad range of frequencies under control. Since it is a non-magnetic material, it has no effect on the driver magnet and effectively improves vibration damping performance. Yamaha’s newly developed driver unit contains a highly magnetic neodymium magnet. Moreover, the diaphragm is designed with a high-precision tangential edge, and the shape of the edge and surface area of the domed vibrating section are set up to ensure optimal movement of the diaphragm according to the volume level during playback. 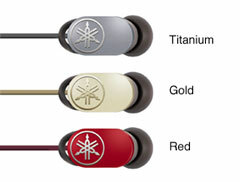 This allows for compact earphones that can reproduce a wide frequency spectrum while delivering a powerful sound. The housing design also optimizes flow resistance in the operation of the diaphragm due to the acoustic port, which functions as a vent. The housing enables precise, rounded bass reproduction. The EPH-52 series is characterized by a simple design decorated only with Yamaha’s distinctive tuning fork logo on the outer flat side of the housings. Each model is finished with an elegant and refined gloss coat, making these earphones an accessory that you will want to use and treasure for years to come. Choose from three beautiful colors. The EPH-R52 is supplied with a remote control that lets you take calls on a connected iOS or Android device. Playback and stop can also be controlled with just the touch of a single button, and volume can be precisely adjusted using an analog-style volume controller. 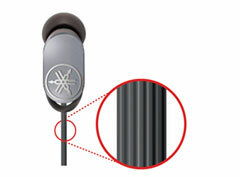 Due to their compact size, the EPH-52 series earphones can be worn in comfort. 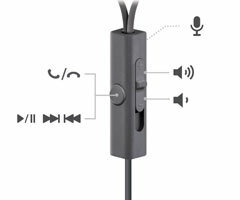 What’s more, Yamaha’s 2Way Ear Supporter allows the earphones to be worn in two different ways – either with the cord over the ear for a more securely fixed position (as shown in style 1), or in the regular way (style 2). The 2Way Ear Supporter is made of a flexible elastomer material, ensuring a snug fit in the ear canal, enabling you to listen to music comfortably and carefree.